Gangster Squad Movie desktop wallpaper, Emma Stone wallpaper, Ryan Gosling wallpaper, Josh Brolin wallpaper, Grace Faraday wallpaper, Sean Penn wallpaper, Mickey Cohen wallpaper, Sgt. Jerry Wooter wallpaper, Sgt. John O'Mara wallpaper, Movie wallpaper - Movies no. 17197. 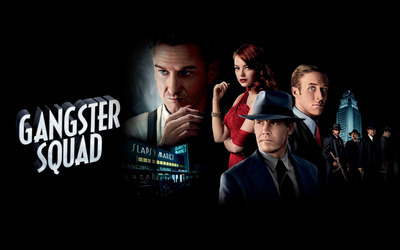 Download this Gangster Squad Emma Stone Ryan Gosling Josh Brolin Grace Faraday Sean Penn Mickey Cohen Sgt. Jerry Wooter Sgt. John O'Mara desktop wallpaper in multiple resolutions for free. Emily Jean "Emma" Stone (born November 6, 1988) is an American actress. Stone was a cast member of the TV series Drive, and made her feature film debut in the comedy Superbad (2007). She appeared in The House Bunny (2008) and Ghosts of Girlfriends Past (2009). She then starred in the horror-comedy Zombieland and the indie comedy Paper Man in 2009.